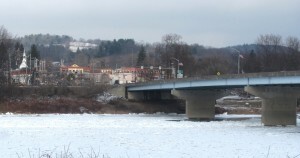 While still flowing freely past most towns along the Susquehanna River, at Tunkhannock cakes of ice are stacking up where the river narrows before a sharp turn to the south. Due to the ice flows, river levels have fluctuated at Tunkhannock over the last week, backing up into the trees along the railroad tracks several times. Daytime highs just above freezing over the next few days aren’t likely to dislodge the ice, and an Arctic blast next week will bring a deeper freeze to the region. For a uniquely Endless Mountains perspective of the weather, check out www.waynesweatherworld.net.